Here's an inexpensive, do-it-yourself wall art project from The New Domestic. 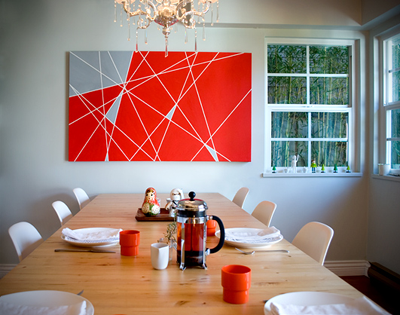 Get a large canvas, mark off lines with tape, and fill in the gaps with paint. Modern and cool! See Nerissa and Peter's project take shape right here. That reminds me on an assignment I had to do for an art class once. Although we had to use black and white paint and make greys in the overlapping sections. I love this!! I have this blank wall in my bedroom and may need to do something similar! so fun! And EASY, too! Wow they actually made a sketch in Illustrator and all. I think I'd just start taping since I'm disorganized and whimsical like that. Would it be as beautiful as theirs? i did this when i was in highschool. i used masking tape and scotch tape for different widths and made a plaid pattern and then painted the whole thing lime green. so fun! Like it.Easy to do and still dramatic.Love the Orange and gray combo. This is insanely cool and easy! Thanks I think I know just where to put this! I love this. Very cool. That is so simple and it looks great! This idea sounds awesome! And sounds like a pretty good idea to try with my toddler! Oh I really like this! I think we're all so much more capable of producing beautiful things than we give ourselves credit for. Lovely idea and even more beautiful result. I am loving how easy this is! I am feeling like I need to make one for over my fireplace. I love this! From the photos it appeared that the artist transferred the layout from a small picture. I hate to sound stupid, but how do you do that? Obviously it can be done freehand, but I just wondered. It's the most simple things that make the biggest statements - so easy!! So awesome! Just wanted to tell you that I LOVE this idea, and I also LOOOOOOOOVE your blog! Glad to know that I'm not the only orange fanatic in the world!